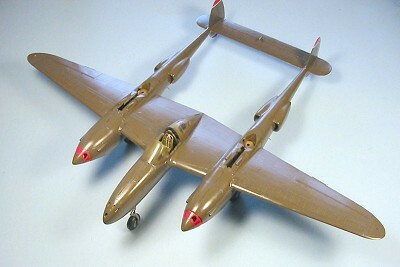 NOTES: H conversion using Rutman resin sets: Early P-38 Engine and Radiator Set; Early P-38 Cockpit Set; Prop Blade Set; Wheel Set. The Lockheed P-38 Lightning was created by legendary aircraft designer Clarence E. “Kelly” Johnson in response to a U.S. Air Corps requirement for a high-altitude interceptor in 1937, and was the first purely military design built by Lockheed. The result was the Lockheed Model 22, a twin-engine, turbocharged, single-seat fighter the heavy armament of one 37mm cannon and four .50 caliber machine guns. Believing that the airplane would never receive a production order for more than 100 aircraft at the most, Johnson made no compromises with aerodynamic efficiency, creating an airplane that - when it did get ordered into mass production as the U.S. prepared for the Second World War - became the most-difficult-to-produce U.S. aircraft of the period. 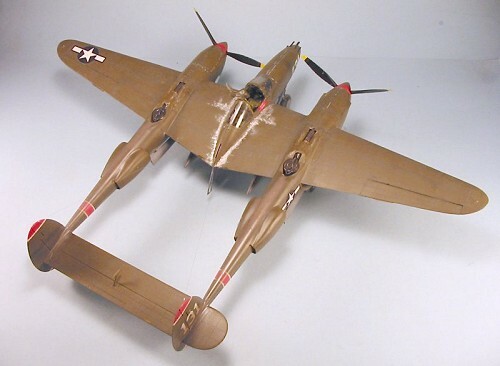 Of the three major USAAF fighters of the war, the P-38 was produced in the lowest numbers, with only 9,500 produced by the time the production line closed in 1945. My own personal involvement with the P-38 has been lifelong. According to the story told by my mother, the very first word I ever said was “o-pane,” spoken in my grandmother’s back yard as a P-38 flew overhead and I pointed at it, on the day Franklin Roosevelt died. I first remember seeing one - an F-5G photo-Lightning used for mapping work that was parked at Arapahoe County Airport - at age 10 (and identified it as an F-5G that night looking through books, being an aeronut already). I loved photographing the P-38s flown by Lefty Gardner and the late Gary Levitz at Reno 30 years ago. Nowadays, when I drive down Empire Avenue just south of Burbank Airport (5 minutes from Le Chateau du Chat), past what used to be the Lockheed factory, I see in my mind’s eye P-38s lined up along the street from there to Buena Vista Avenue half a mile away, awaiting their final assembly. What a sight that must have been! To this day, if I walk onto an airport and there are 10 warbirds there, and one is a P-38, it’s the one I’ll walk over to first. Nothing else looks like a P-38, sounds like a P-38 or flies like a P-38. Thomas B. McGuire, Jr., is forever known as America’s “number two” ace, scoring 38 victories before being killed in air combat on January 7, 1945. He is a controversial figure to some, as he was completely open about his desire to be the top ace, and always saw Richard I. Bong - who would be the American Ace of Aces with 40 victories - as the man to beat from the time he entered combat in August 1943, some six months behind Bong. He was considered by those who knew him prickly and difficult to know, a man whose reputation was based on his skill with a P-38, not for his interpersonal skills. This past May 15, I had the opportunity out at the annual Chino Air Show to speak at length with two men who had flown with McGuire in the 475th Fighter Group. One of them in passing gave me what I think is the key to understanding him. “Tommy McGuire was a complete failure, socially. But he knew more about the P-38 and how to get the most out of it, of anyone. He could talk for hours about that airplane in great detail to the point of driving everyone else nuts.” I personally think, based on this description and some other comments made in response to further questions, that McGuire had Asperger’s Syndrome, a brain condition on the continuum from autism, which has only been detailed in the last ten years and is associated with males of high intelligence; its presence results in people who can be described pretty much as was stated above: unable to “read the room” socially, with a singular interest in a particular subject, about which they can become a “little professor.” The reason I know so much about this is that I too have Asperger’s, something I only discovered 18 months ago. Of course, there’s no way to “prove” this about McGuire, but looking at his biography with the knowledge of what Asperger’s is and how it works, it seems to me to be that “lens of clarity” that puts everything viewed into sharp focus. Born August 1, 1920, Thomas Buchanan "Tommy" McGuire, Jr., joined the AAF on July 12, 1941, graduating in February 1942. After fighter training with the 50th Pursuit Group at Key Field, Mississippi, his first operational assignment was with the 54th Pursuit Group in Nome, Alaska, where he flew P-39s, honing his flying and shooting skills until his repeated transfer requests resulted in his return to California that October. After taking P-38 training at Santa Ana, California, he was sent to Australia in March 1943. Originally assigned to the 49th Fighter Group, he was transferred to the 431st Fighter Squadron, 475th Fighter Group on July 20. The 475th Fighter Group is a very special unit in Air Force history. The only fighter group formed overseas, whose entire service was strictly overseas, the unit was the creation of MGEN George C. Kenney, commander of the 5th Air Force. Where other commanders had their doubts about the P-38, Kenney couldn’t get enough of them. Starting in December, 1942, he tried to put one P-38 squadron in each of his fighter groups, but what he really wanted was an entire group equipped with P-38s to act as his elite air supremacy force. He finally got Hap Arnold to give him enough P-38Hs - which other air commanders weren’t hot about because of their engine cooling problems - and established the 475th in April 1943. He required every group commander to provide pilots for the new organization, specifically ordering them “don’t send any deadheads,” since getting rid of under-performers is the usual response of commanders to such requests. The personnel assigned were all first-rate, and the 475th went on to become the top-scoring fighter unit of the 5th Air Force, entering combat in New Guinea in August 1943, and fighting throughout the New Guinea and Philippines campaigns, ending the war flying missions over Kyushu from Okinawa. McGuire got an initial reputation in the unit as a “brown-noser,” when his enthusiasm for the P-38 got him appointed maintenance officer for the 431st F.S. According to the two members of the unit I interviewed, this attitude changed when aircraft availability moved up from 50% to over 80% as the ground crews were motivated by a young officer who didn’t pay attention to military propriety and wasn’t afraid to get his fingernails dirty working on the airplanes with them. On his second combat mission, a sweep of the major Japanese base at Wewak on the northern coast of New Guinea flown August 18, 1943, McGuire demonstrated his flying and gunnery skills by attacking five Zeros and shooting down four; another pilot also shot at the last one, and - since there were no shared kills in the 475th - he lost the coin-toss on #4, being given credit for 3, which was quite a way to lose one’s “virginity.” On August 21, he shot down two more and a twin engine Ki-45, to become the first pilot to become an ace completely within the group. By early September his score stood at 9 and he made no secret of his goal of beating Bong. The attitude did nothing to endear him to many, since an obvious display of ambition like that was socially frowned upon. 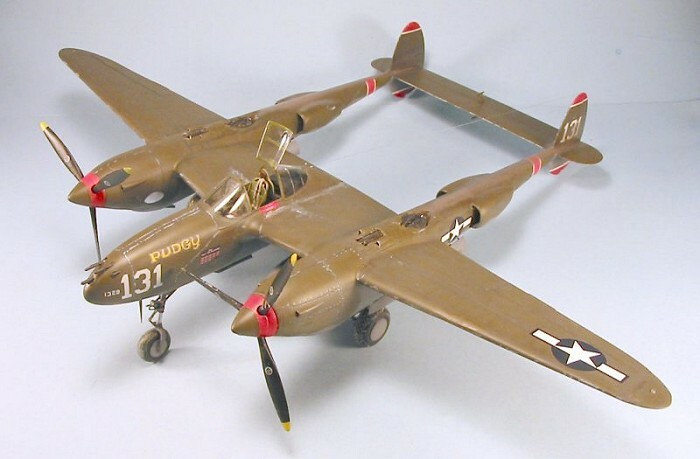 In mid-September, another pilot crash-landed his P-38H-1, which he had named “Pudgy.” He received a new P-38H-5, which was also named “Pudgy” (McGuire did not identify different airplanes till “Pudgy IV,” the P-38J-25LO he took delivery on in August 1944). On September 28, he christened the second “Pudgy” by shooting down two more Zeros over Wewak, followed by another one shot down over Oro Bay while covering the landings there on October 15. On October 17, 1943, his P-38 was down for maintenance, so McGuire made that day’s mission in another pilot’s airplane. In a wild combat over Oro Bay, he shot down two Zeros escorting bombers attempting to hit the invasion fleet, only to fall victim to a third Zero which resulted in his bailing out over the fleet, badly wounded. He was evacuated to Australia and remained in the hospital until December 12. For a thorough review of what’s in the box, please visit the preview. Construction of the kit may appear daunting when the box is first opened, but it is well-designed, and if a modeler follows the logical instruction booklet, there are no surprises waiting. While I love all versions of P-38s, I particularly like the look of the early P-38s, with their sleek pointed noses at the front of the engine booms. Thus, when Resinmeister Jerry Rutman contacted me after he found out I had one of the first kits in the country to ask if I’d be willing to let him use the kit as the basis for creating resin conversion parts for the early versions, the answer was a big yes. 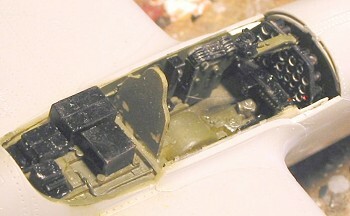 Jerry also took the opportunity to create a resin cockpit to fit the kit, which is also used in this project. While he was at it, he realized the propeller blades are the one thing on the kit that isn’t correct as far as shape is concerned, and he made a resin correction set for that. I was also very happy to use his resin tires, since I have had nothing but trouble trying to use those @#$%$#@!! actual rubber tires with plastic hubs on other models. 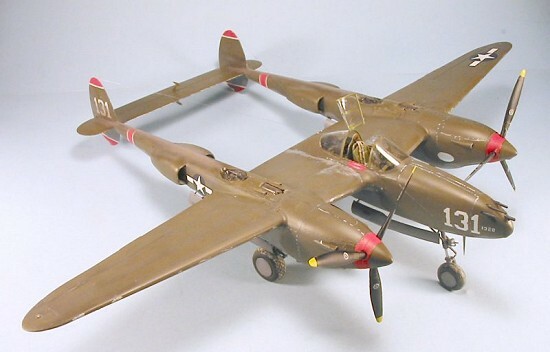 The end result is, this is an article about converting the Trumpeter kit to an early P-38. I happened to choose to do McGuire’s second “Pudgy” due to the fact that the only unused early P-38 decal sheet I had was for this airplane; I sent that on to my good friend John Lester, who scanned the sheet and enlarged the personal markings to 1/32 from 1/48 scale, and printed them up for me on his trusty ALPS. Regarding the construction of this model, the only “difficult” part involved the fit of the resin radiator housings to the booms - a problem solved with the use of some Bondo and sandpaper, followed by an application of Mr. Surfacer 500 and some clean-up sanding. The engine cowl plug fit with no difficulty. Also, if you elect to build an early P-38, you will have to get rid of the four “bumps” on the lower wing surface. The easiest way to do this is to fill them with Cyanoacrylate glue at the outset, let that dry inside them fully, then cut them off, sand smooth, apply Mr. Surfacer, etc. If you are going to build any of these Trumpeter kits with their engraved rivet detail, I strongly suggest you go to the local sewing crafts store and get a pounce wheel, which will allow you to easily re-scribe the rivet detail you’ll be sanding away when you do things like this modification. You also need to fill in the little square hole in the outer wing lower surface and get rid of the attachment points for the dive flaps; this also results in using Mr. Surfacer, sanding down, and running the pounce wheel along to restore the surface. Additionally, if you are doing an early version, remember to cut off the gun camera housing from the left underwing pylon; it’s not difficult to modify with razor saw and sanding stick. The cockpit provided in the kit is not bad, other than the seat, which manages to have mold marks very prominently inside the seat. 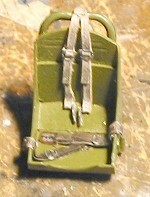 In fact, the cockpit is good enough that I will likely use it in my second P-38 model, though I will definitely use one of Jerry’s resin seats. That said, if you are going to buy a kit that costs more than $100, you are likely doing so because you are a particular fan of the particular airplane. Jerry’s resin cockpit is so superior to the kit cockpit that if you are only going to do one of these (as most people will), it’s worth the extra cost to get the extra detail and make the model “definitive.” The one thing to be certain to get, regardless of which cockpit you use, is the Cutting Edge posable resin seatbelts; in this scale they’re so far beyond photoetch in terms of the realism of the final look, there’s no comparison. The interior detail for the nose and the engines is pretty impressive, but the truth is that if you use either, you should be prepared to do some super-detailing here. In this scale, with these areas so visible to the observer, you really need to do “all or nothing at all” here. You’ll have to cut open the engine cowls to display the engines if you do this, and that will involve some considerable scratchbuilding of the internal cowling structure, none of which is provided by the kit. That said, these parts provide an excellent base on which to build an impressive display, but they should not be seen as otherwise. 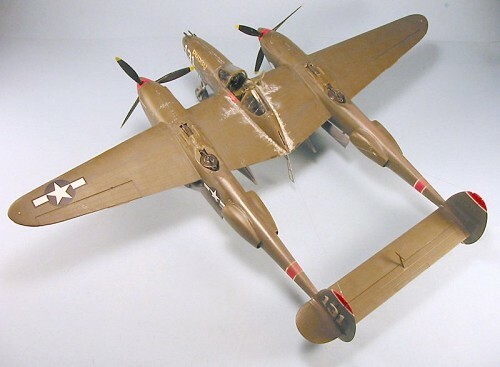 As a personal comment here, my suspicion is that the majority of modelers - like me - think the P-38 looks good closed up. I wish Trumpeter would follow the strategy Hasegawa has used with its Bf-109s and Fw-190s, i.e., provide the basics for a good model with the cockpit open and the rest closed up; that way, anyone who wanted to could get resin aftermarket sets for the gun bay and the engines, and the basic kit could have been sold at a price around $60 - which would likely result in people buying more than one, the way they buy more than one of the Hasegawa kits. The big thing with this kit is insuring a nose sit. While the real thing has engines and weapons all ahead of the main gear, with the model most of the weight is aft of the gear. Since I had solid plugs in the nose of each boom, I had to put weight in both the booms - above the resin plugs - and in the nose. I put in a little extra weight because I was going to modify the nose gear leg to allow the “tail-low” sit that most P-38s have unless they are fully-loaded for a mission. Trumpeter provides the nose gear with the oleo fully-compressed, which is the way it would be if the airplane were sitting there with full ammo, full fuel, and a full external ordnance load of two 1,000-lb. bombs and the ten HVARs the kit provides. This does make the sit easier, but a completely-horizontal P-38 just doesn’t look that good to me. What I did was assemble the gear leg, cut off the bit of oleo strut, drill into each part of the leg, and replace the oleo strut with a cut-down nail of the correct diameter, which I super-glued in position. I examined all three of the P-38s that were on display out at Chino on May 15 to get the correct angle of sit for this. The oleo scissors was merely cut in two and re-posed. As an overall comment on assembly, this is perhaps the best-engineered Trumpeter kit to date. Everything fits easily if you follow the instructions, and I only needed to use Mr. Surfacer along various seams to get rid of them. First off, this is a big model, and a heavy one if you have enough weight in there for a nose-sitter. DO NOT handle this thing by the outer wings or the tail while you are painting. I grabbed the outer wing at one point, and felt the model definitely “bend” at the wing joint. Hold it by the central nacelle or the booms only. For painting, I started by pre-shading the model, which is a long an involved process due to size. I then painted the areas where the squadron markings would go white, masked off the trim areas, and then painted the red areas, using Gunze-Sangyo “Shine Red.” This was then masked off, and the lower surface was painted with Tamiya “Neutral Grey” - this took nearly half of a big bottle, so be aware you are going to be using some paint here. I went back over the lower surfaces and lightened the various panels after putting some Tamiya “Sky Grey” in the paint to lighten the tone. The upper surface presented some problems. By size alone, you cannot leave the model in a monochromatic single shade of Olive Drab, because it will look visually boring. From the scoreboard I had in my decals, this would be a model of “Pudgy” after the score of October 17, but before the score of December 26, 1943. I figure it is the airplane as it looked when McGuire returned from the hospital. The airplane had probably arrived in SWPA by July 1943, been reassembled, then sent to Townsville for final modification, and then sent on to the 475th at Three Mile ‘Drome in New Guinea that September. All of this is “winter” down under. McGuire flew the airplane for a month before he was shot down, then it was used by other pilots for the two months he was in the hospital. All of the time from arrival in New Guinea would have been under “equatorial” conditions, so sun-fading would be very apparent on the upper surfaces. I accomplished this by starting with an application of Tamiya “Khaki” over the panel line areas, followed by an application of Gunze-Sangyo “Olive Drab 2,” the color identified as used for “US Army Tank” inside the panel areas, followed by application of Gunze-Sangyo “Olive Drab 1" over various upper areas, then re-painted with a combination of “Olive Drab 1" with a touch of Gunze-Sangyo “Sail Color” added, to simulate sun fading. This is all pretty subtle, and I can assure you that if it doesn’t show up clearly in the photos, it is apparent in person and gives a good effect. Additionally, there is another visual problem with camouflaged P-38s in the South Pacific. If you look at photos, you will see the panel lines in many pictures seem “emphasized” as if they were models. What that is is the residue of the sealer used to protect the airplane during its shipment overseas, which had to be removed during reassembly at the depot. Pilots I have interviewed who flew in the SWPA have told me that the sealer residue seemed common on camouflaged aircraft. You also see it on airplanes in the ETO - where some “markings experts” have been known to state that this is a different color of paint on the airplane. It’s not - it’s sealer residue. This stuff was sort of like a rubbery tar, and black in color. 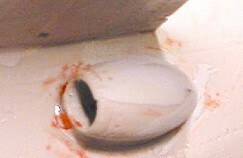 It got scraped off, and left a residue that varied in thickness and visibility. The way I did that was, after the model was painted, I went over the panel lines with Tamiya “Smoke” which had been darkened with a little bit of black. Then I thinned Neutral Grey and Olive Drab, respectively, and went over the lines to make them irregular in how much they show. Yes, this is a whole lot more than you need to do to a 1/48 kit, but recall that this model is physically nearly four times as big as a 1/48 Lightning! I used the kit decals for the national markings, and stencils from an old SuperScale 1/48 sheet that did the stencils too big for 1/48 (a common failing with SuperScale back in the 80s), making them actually right for 1/32, since most stenciling is smaller than one would think. As noted above, the personal markings were specially made on an ALPS printer by enlarging the markings on a SuperScale 1/48 sheet. Looking at photos of 475th FG P-38s, they seem remarkably well-maintained for where they were operated, without a lot of dings. I suspect that, as the squadron maintenance officer, McGuire’s airplane may have been a particular beneficiary of any maintenance, applying paint to dings that turned up to avoid corrosion. 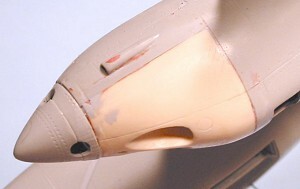 Thus, I only chipped paint along the attachment screws for the cowling panels, and along the edge of the gun bay panels, and the area to either side of the cockpit where the pilot and ground crew would have walked. It was at this point that I discovered that Trumpeter has designed the turbos to be installed in position before final assembly of the booms, since they are part of the internal system provided. Thus, I had to do some trimming, and quite a bit of pushing and shoving, to get them in position at this stage of the game, essentially putting them in from the “wrong” side. I suggest you assemble them on yours per the instructions and then hand-paint them - since they are not some smooth-finish item and you will be staining them for an accurate look anyway, this will not present a problem for the final look. I did the exhaust staining along the upper rear of the boom and over the rudder in three layers - a first application of Tamiya “Smoke,” then an application of thinned Light Grey, then adding a bit of black to that and going over, then adding in a little bit of brown. Be sure this is all thinned and applied lightly. I “muddied-up” the wheels with some Gunze-Sangyo “Sail Color,” applied with a dry brush to set off the diamond pattern in the tread, sanded a flat spot on each tire, and then glued the wheels in position. I then attached the props - remember that the Lightning’s props rotate outwards on both sides. 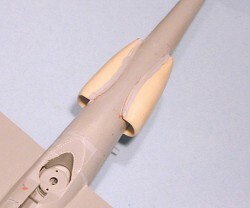 The canopy lid was attached, and I finished off by installing the gun barrels. The antenna wires were done with invisible nylon thread, with a drop of white glue at either end. Personally, I am very pleased with this model. The project came together even better than I had hoped, which is always good for a pleasant moment. 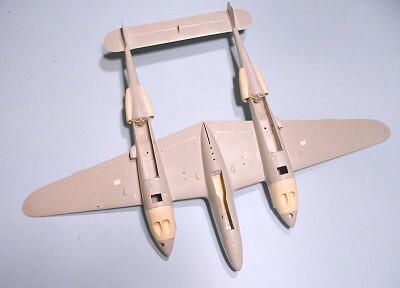 Overall, the model is really not that much more difficult to build than a Hasegawa 1/48 P-38, other than there are extra pieces involved with the control surfaces. It is really not as hard as it appears when you first open the box. Some people have commented that the upper wing part has some noticeable mold flaws. Mine did not, and neither does the second one I recently obtained. As someone fortunate to have access to several versions of the real thing out at Chino, I can say that this kit is the most accurate model yet released by Trumpeter - the only “ding” is that the prop blades are not entirely right in shape, and the difference is only noticeable if you know what you are looking at or compare them closely with photos. 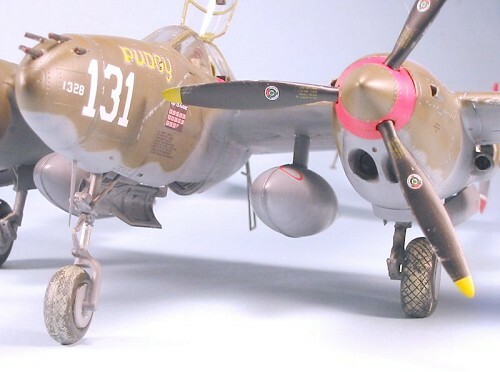 I like it enough that when a fellow modeler refused to believe my statement about how easy it is to build and said it was too hard for him, I was very happy to take his kit off his hands, and will be using it to make McGuire’s last P-38, “Pudgy V,” in the near future.